Available on ArkivMusic, Amazon, iTunes, and all major retailers and digital outlets. Robert Paterson is the winner of the Composer of The Year Award from the Classical Recording Foundation for his new album The Book of Goddesses. This album contains three new works, all featuring harp. The Book of Goddesses (the title work) for flute, harp and percussion is in nine movements and performed by MAYA. 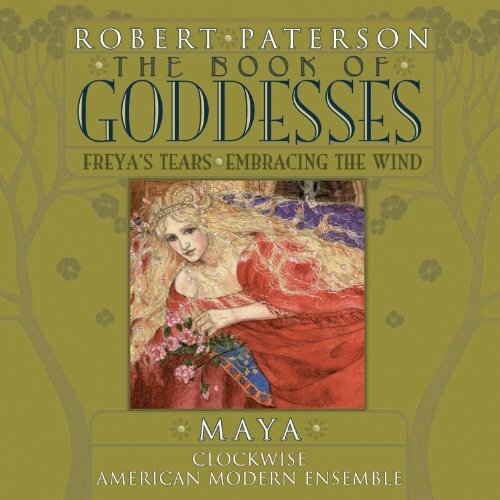 Freya's Tears for violin and harp is performed by Clockwise and Embracing the Wind for flute, viola and harp is performed by the American Modern Ensemble. The inspiration for The Book of Goddesses, and the source of the title, is the beautiful, lavishly illustrated book of the same name by Kris Waldherr, a Brooklyn based author, illustrator, designer and cellist. Waldherr s book contains descriptions and images of hundreds of female deities from around the world, some featured more prominently than others. The second work, Freya's Tears, is the sister piece for The Book of Goddesses, and is also inspired by goddesses. All three works are beautifully performed by MAYA, Clockwise and the American Modern Ensemble. Of special note is the beautifully designed packaging which is covered in gold foil and bound like a hardcover book. The booklet contains many of the images and descriptions from the Waldherr's book. This CD makes a perfect gift, whether during the holidays, as a wedding gift or simply for relaxation.